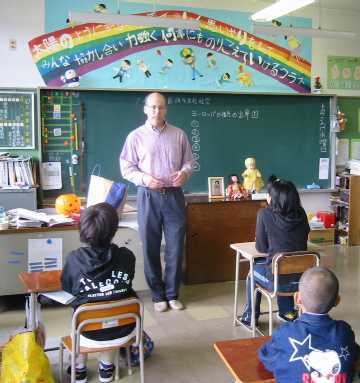 This school visit was arranged and supported by the members of the Miyagi Blue-eyed Doll Study Group. The 30 members of this group has been very active during the past two years in researching the history of the Blue-eyed Dolls sent to Miyagi Prefecture, publishing the results of their work, and creating classroom materials. 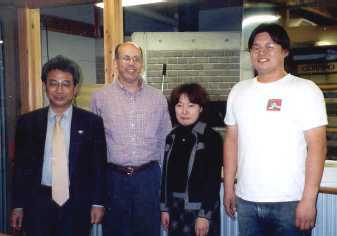 For example, this summer three members of the group published a 40-page article with photos in a journal published by the Sendai Historical Museum. Now the group is busy with preparations for the homecoming next spring of Miss Miyagi, the Japanese Friendship Doll sent to the U.S. in 1927 as a thank-you gift for the many Blue-eyed Dolls sent by American children to Japan. The visit to Murata Daiyon Elementary School was my fifth visit to a Miyagi Prefecture school that has a Blue-eyed Doll from 1927. Last November I had the opportunity to visit Monou Elementary School, Sanbongi Elementary School, Hirobuchi Kindergarten, and Kawatabi Elementary School. Shuji Satoh, who works at Miyagi Co-op in the promotion of cultural activities throughout the prefecture, kindly took me by car to visit the schools both this year and last year. Ken and Tomoko Shizukuishi let me stay in their large traditional Japanese farmhouse built over 100 years ago, and I had the opportunity to enjoy eating rice grown on their farm and oysters and cow's tongue cooked over a fire. Mrs. Shizukuishi helped organize the visit to Murata Daiyon Elementary School, and over the past year she and the Miyagi Blue-eyed Doll Study Group have provided me with much information and many photos that I have been able to use for my Friendship Dolls web site. My visit at the school started in the office of the principal, who showed me the school's Blue-eyed Doll named Mary and the Japanese doll who kept her company during World War II when they were hidden to prevent their destruction. 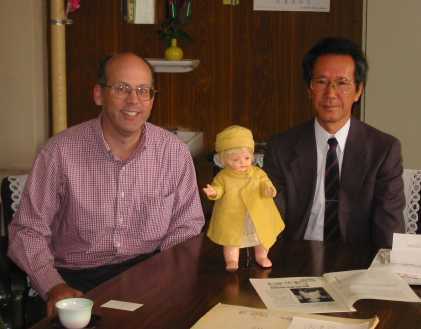 The two dolls were discovered together in 1946 by the school's janitor Mr. Saito, and he took great care to preserve the two dolls by sometimes putting mothballs inside their case and by airing out the case from time to time. Now the two dolls are displayed in a special case in the principal's office. A previous sixth-grade class made a cute sign that now hangs outside the principal's office. 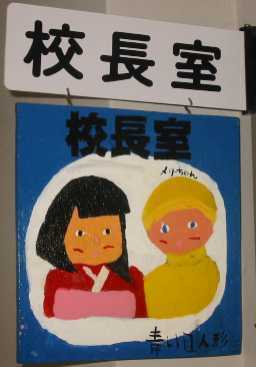 The sign has drawings of the two valuable dolls displayed in the office. The principal gave me a booklet about the history of Mary. 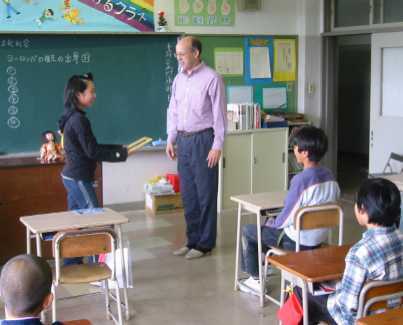 After my pleasant visit with the principal, I participated in a calligraphy class for the 11 sixth-grade students where we had to write the three Japanese characters for "ma-tsu-ri" or "festival." 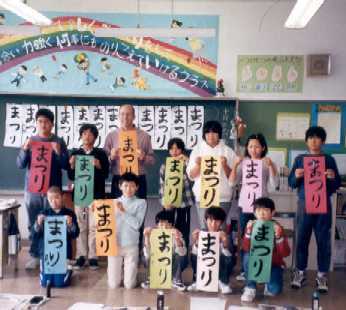 The teacher selected this word because the town would celebrate a special festival in a couple of days. This class was only my second attempt to draw Japanese characters with brush and ink, so I quickly produced many practice sheets that ended up in the trash. At the end of the class, each person's best work was displayed on the board in front. I was happy at the end of this frustrating but fun class that my work of calligraphy seemed to fit in quite well with the students' works. Thank you very much for giving this beautiful Ambassador Doll in 1927. Miss Miyagi came from Japan to Kansas in 1928 as a Japanese-American Friendship Ambassador. Even now she delights American children. This year Miss Miyagi, together with four other dolls such as Miss Hokkaido and Miss Mie, were shown as sister Ambassador Dolls at a special exhibit at a museum in Missouri, the state next to Kansas. 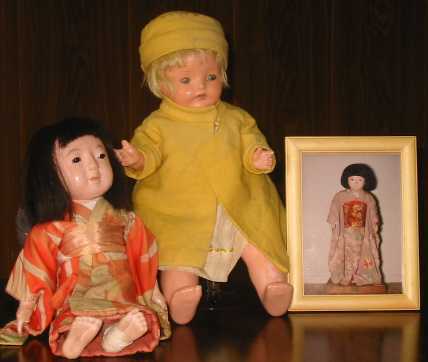 The American Blue-eyed Dolls and the Japanese Ambassador Dolls are precious symbols of friendship and peace. We want to always take good care of Miss Miyagi. We would be delighted if you would place Miss Miyagi's photo next to your school's Blue-eyed Doll. 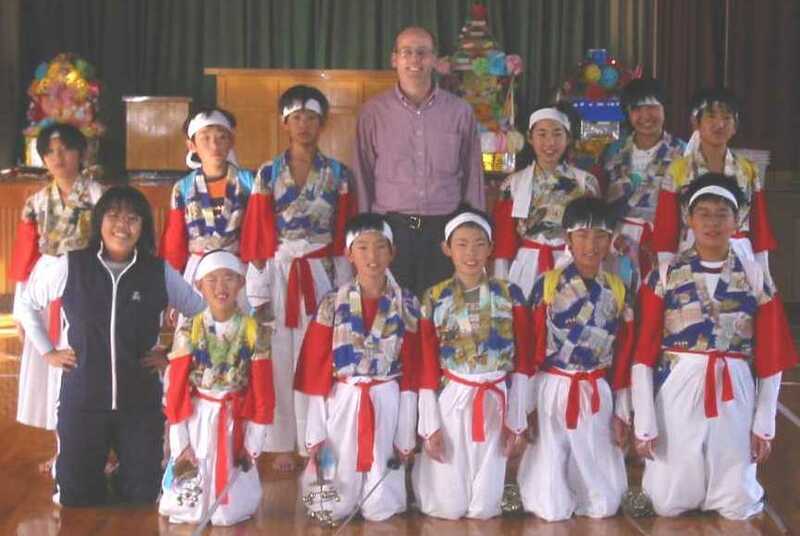 During the next part of the class I explained to the students that many Americans do not have blue eyes and white skin like the Blue-eyed Dolls given by American children to Japan in 1927. The ancestors of Americans came from countries all over the world, and even today the United States has many immigrants from Asia, Mexico, and South America. We also briefly discussed America's history of discrimination and prejudice against African Americans, Native Americans, and other groups of people. Most Japanese elementary school students eat lunch in their classrooms, but all 56 students at Murata Daiyon Elementary eat together, probably due to the small size of the school. 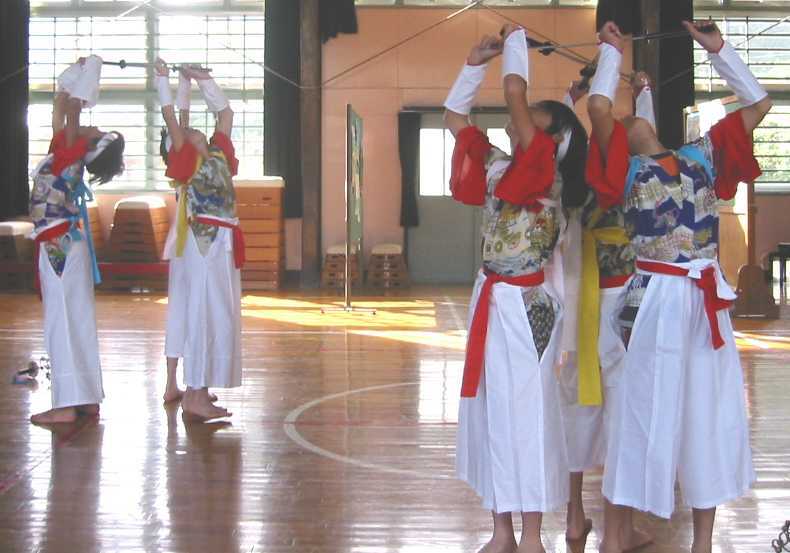 In the early afternoon, the sixth-grade students used the gymnasium to practice a beautiful traditional Japanese dance with swords (not real of course). A camera crew from a local TV station greeted me when I entered the school and continued with me throughout the morning. I forgot about them when talking to others, but it was nerve-wracking when the camera focused on my clumsy attempts to write Japanese characters with brush and ink. Also, I was a little startled when I was in the middle of talking to the sixth-grade class when they asked me if it were OK to interview two or three students. The rest of us took a break during this time, and I showed them a Halloween pumpkin mask and distributed some wrapped Halloween chocolates in shapes such as Frankenstein, ghosts, and Dracula. At the end of the day, the principal gave me a special doll named Hotei-sama, which is made in the town of Murata. Hotei-sama is one of the Seven Gods of Fortune, and Murata Town celebrates Hotei Festival near the end of October. The sixth-grade teacher is a big fan of Doraemon, a cat-shaped robot from the 22nd century who can pull all sorts of secret tools out of his "Fourth Dimensional Pocket" on his tummy whenever a boy named Nobita needs them to get himself out of trouble. She gave me a couple of Doraemon comic books printed with dialogue in both Japanese and English. In the trains and subways in and near Tokyo, I had to stand most of the time, so I passed the time reading these comic books, which I completed even before I left Japan. Pizza - We went to a pizza and bread restaurant connected with a community center for handicapped people. Maybe I had been eating Japanese food for too many days in a row, but this pizza was the best I have ever had in my life. The pizza was cooked in a large brick oven over a fire, and I also added some of the "spicy oil" available at each table. The restaurant workers were very friendly, and they even came out of the restaurant and waved and bowed as we were leaving in the car. At breakfast the next morning I savored some of the bread from the restaurant. 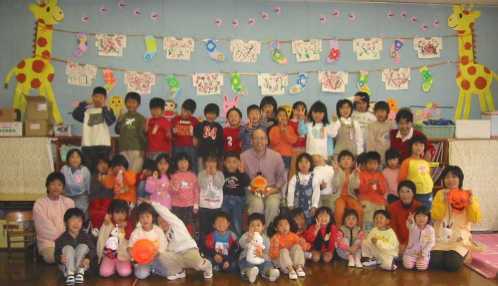 Miake Kindergarten - I made a brief stop at a kindergarten near Mr. and Mrs. Shizukuishi's house to talk about American greetings and Halloween. Afterwards we had fun washing sweet potatoes, some of which were gigantic, in three large tubs of water outside. Matsushima - The view from the coast of Matsushima, a short distance from Miyagi's capital of Sendai, is one of the three most famous scenic views in Japan. However, we stopped by in the evening, so we could not see very much. Local Beer - I tried a bottle of locally-brewed beer, which tasted quite delicious and had a distinct banana flavor (at least to me). In comparison to the U.S., the variety of local beers in Japan is limited, and usually these beers have a high price tag, about $5 for a regular bottle. Doll at Marumori Library - The locked safe at the library of the small town of Marumori contains one of the eight Blue-eyed Dolls that have been found in Miyagi Prefecture. This doll is in sorry shape now, with no hair and a hole in the top of its head. 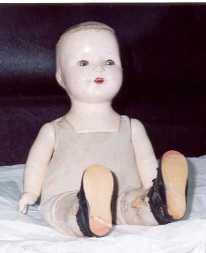 The doll has no clothing other than its undergarments and shoes. Marumori Town Office - After the visit to Murata Daiyon Elementary, we stopped at the Town Office of Marumori to meet Mr. Iwao Sato, who had a great deal of information about the Friendship Dolls that he let Mrs. Shizukuishi have for her research about the dolls of Miyagi Prefecture. He gave me a book about Ujo Noguchi, who wrote the song "Blue-eyed Doll," which became the term used in Japan for each of the 12,739 dolls sent by America to Japan in 1927. The book contains the stories behind the many children's songs written by Ujo Noguchi, and there is also a CD with his songs. Package from Kagawa - After I arrived in Miyagi Prefecture at the Sendai train station, we drove to the Sendai Historical Museum, where the Miyagi Blue-eyed Doll Study Group holds their regular meetings. The museum curator, who I had met in my prior year visit, gave me a surprise package from Tatsuya Matsuda, who lives in Kagawa Prefecture and who I have never met before. The package contained much material about the Blue-eyed Dolls, including many photos of three Blue-eyed Dolls in Kochi, Ehime, and Hyogo Prefectures. Cow's Tongue - Cow's tongue is one of the specialties of the city of Sendai, and you can even buy a box lunch at the train station with cow's tongue in it. I ate some delicious cow's tongue twice during my visit. On the night of my arrival, we had cow's tongue cooked over a fire at the home of the Shizukuishi family. As I was leaving Miyagi, we also ate at a cow's tongue restaurant across from the train station. We entered the restaurant before noon so we only had to wait less than five minutes, but while we were eating, a line formed outside the restaurant. About 20 people were standing in the rain waiting to eat Sendai's delicious specialty.